There's action in the solar developer market. Last week we reported on the acquisition of Axio Power by SunEdison. GTM Research's Shayle Kann went so far as to predict that Lincoln Renewable Energy might be the next developer to be acquired in a consolidating market. Today, we saw some additional investor interest in the space. Agile Energy, a developer of utility-scale renewable power generating projects, just announced that it has closed a $24 million second round of investment from Good Energies Capital, bringing the total amount of the investment by Good Energies to $37 million. 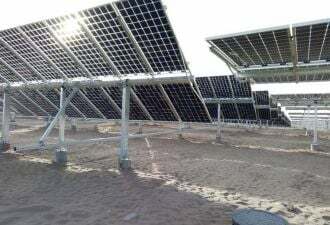 The highest-profile project that Agile Energy is working on is a 50-megawatt solar project in Ohio with utility American Electric Power (NYSE: AEP). When completed, it will be one of the globe's largest photovoltaic (PV) projects and could hold the title for the largest PV project in the U.S. The project will likely use about 239,400 panels in the solar array. The project is named Turning Point Solar. It's actually 49.9 megawatts and will be built on 500 acres of reclaimed strip-mined land that was used by the Central Ohio Coal Company between 1969 and 1991. The project is early in its development so there are still missing pieces in terms of suppliers and financing. But the panel supplier is Isofoton, a Spanish firm that is setting up manufacturing facilities in the Buckeye State, creating hundreds of permanent manufacturing jobs. Ohio's advanced energy portfolio standard calls for 25 percent by 2025 with a carve-out for solar power, so this enormous project goes a considerable way toward helping to meet that goal. The deal with AEP is a develop-transfer structure, rather than a PPA. Michael Morris, the CEO of AEP, is a supporter of the project and AEP has expressed interest in investing once the project is developed. The project would not be financeable without AEP as the customer. When the project has received financing, Agile could still maintain management of the project.